Everyone has their thoughtful, unique reasons for purchasing solar panels. Maybe you are looking at installing solar panels on your home or business because you want to save money and divert a greater portion of your financial resources towards the people you love. Perhaps you are concerned about the state of our environment and want to safeguard the planet for the people you love. Whatever your thoughts, however you seek to balance your ecological or budgetary motives, your central concerns are connected to people. You care about saving money or saving the world, but people are your priority. So the first answer to Why Guelph Solar? Is OUR people. The attention to people at Guelph Solar begins with President Steve Dyck. He is a dynamic leader who wants the best for his customers, his employees, our province and our planet. Whether it is Steve’s commitment to our community by supporting a host of charitable and neighbourhood-building efforts or his passion for making environmentally aware choices, you will find Steve ready to help you go green. Steve has gathered together a team of people that are dedicated, creative, educated and informed. Your panels and your installation will not be in the hands of contractors, your installation will be carried out by Guelph Solar staff; problem-solving, experienced pros, every one of them. Guelph Solar has been in business since 2009 and our stature has grown every year. 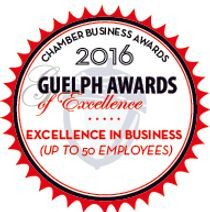 We are known and trusted in the community and are especially proud of being awarded the 2016 Excellence in Business Award from the Guelph Chamber of Commerce. Our customers are thrilled with their Guelph Solar experience. Check out the testimonials, as customer after customer praises the process that ends with you owning your power. Come aboard. Remember, we put the sun to work for you. We are recognized as a Living Wage Employer, paying our staff at least enough for themselves and their families to live healthily, meet their basic expenses, and be able to participate in work, family life, and community activities. Bridges out of Poverty and other poverty alleviation efforts in Guelph - Steve Dyck, President of Guelph Solar is very passionate about this work and spends much of his time outside of his day job connecting with and supporting families which are underprivileged in Guelph. Yorklands Green Hub - Helping to create and maintain a versatile and self-sustaining education, demonstration, innovation and research hub. Hooping for Hunger - Hunger alleviation fundraiser supporting the Chalmers Community Centre in Guelph and the Hunger Project, and run by FLOW Office Wisdom. Guelph Coalition for Active Transportation - A vision for Guelph to increase the quantity, quality, and safety of active transportation in Guelph. Transition Guelph - Promote processes and projects for strengthening community resilience and economic vitality. We participate in many community events and support many community groups in Guelph and the surrounding area. Our employees are involved in community organizations and efforts to make our town and country a better place. Please get in touch if you would like us to participate in your event or community effort. Guelph Solar will be attending the events below - see you there! eMerge EcoMarket 2019 ~ Old Quebec Street Mall, Guelph. March 23, 2019. Discover your path to energy savings! The Eco Market - Waterloo Region Museum, 10 Huron Rd Kitchener. April 27, 2019. The Canadian green event of the year! Solar Energy Solutions Workshop - On Grid Solar - Guelph Public Library 100 Norfolk St Guelph. 7-8 pm April 15, 2019. Bring your hydro bills and see how much money you can save by generating your own clean energy! Solar Energy Solutions Workshop - Off Grid Solar - Guelph Public Library 100 Norfolk St Guelph. 7-8 pm April 29, 2019. Learn about off grid solar solutions in this informative workshop. We think we're pretty good at what we do. But you don't have to take our word for it. Check out what others have to say about our fantastic solar energy systems. For more testimonials, please see our Google Reviews. I have been meaning to get back to you all at Guelph Solar to tell you about the great job your team did in the spring putting solar panels on my roof at 46 James Street West. I remember the thrill when the first check arrived from Guelph Hydro to say that I had earned nearly $900 on the Guelph Solar installation you put in this summer. I have great admiration for the way that your company is organized and for the competent and pleasant people who did what they said they would do, on time and within the estimated budget. I can unreservedly recommend Guelph Solar to other householders as the best available investment in these days of low interest rates. When the system is paid for, the income generated from her solar business will be equivalent to the rest of our property tax plus a vacation. Our retirement plan just got a boost. At the end of our contract with the Ontario Power Authority (OPA) our home will provide its own power. Guelph Solar, thanks for an exceptional experience throughout the installation process - great customer service! Just thought I would give you an update. Pool heater is working great, never had the pool this warm. It was a pleasure working with you, and I would highly recommend your company. Securing the OPA contract is probably the hardest part of the MicroFIT Process. Steve made himself available in person, by phone, email and text to help me work through the required paperwork. His experience in dealing with both the OPA and Guelph Hydro made this process a breeze. From my initial meeting with Steve through to final connection, I found Guelph Solar to be very approachable and organized. They met all there promised deadlines and kept me in the loop along the way. Steve was flexible enough to allow me to be part of the installation process. Working with Guelph Solar from the initial idea to the up and going has been a pleasure throughout. Each person has been professional, knowledgeable, courteous, and friendly. They have educated me and taken care of each detail quickly and thoughtfully. I would strongly recommend them to anyone else! Guelph Solar was a pleasure to work with! Our solar project was not a typical project and had a few more complications as we were also building a structure to put the panels on. ?Steve was a life saver for this project. His practical, common sense approach was key. He was dedicated to making sure our project met the required timeline goals and it didn't matter the time of day or the day of the week; ?he was here in a flash when we needed advice. ?The installers were also very respectful, knowledgeable and approachable. I highly recommend Guelph Solar to anyone thinking about solar. You won't be disappointed with the service. It makes economic sense when you do all the calculations of money you're going to save and the government has a good subsidy program. Our payback is 3.5 years and our return on investment is high. These things all together convinced us it was the right thing to do. It's hard to invest your money in something and get your pay back that fast. I think it makes a lot of sense both financially and environmentally for people to do. I am just over the moon with how well the solar pool heater works. We had a bad experience with our other pool heater. But your (Guelph Solar) system works. I can hardly get the kids out of the pool. That is why we have a pool. And I like it too. It was over 90F yesterday. And I like how efficient it is. Thanks! Guelph Solar Mechanical Inc. helped Guelph Campus Co-op identify and access grants that were hard to find. Steve is an expert in sustainable energy project development, from system design to obtaining the renewable energy grants. Guelph Solar Mechanical Inc. designed and installed systems on five of our apartment buildings - and they work! Steve Dyck of Guelph Solar Mechanical provided consultation and installation services for an evacuated tube solar hot water system for my home-office in Fall 2009. I was very happy with Steve's technical review of various components and design considerations that I had proposed. Steve provided critical thought and modifications to equipment required for my domestic water and space heating application. I have also been very pleased with the performance of the system's performance which has seen 100% of our domestic needs satisfied while a reasonable contribution to space heating via infloor hydronics and hot water radiators was observed in winter months. Steve Dyck of Guelph Solar Hot Water installed a Domestic Solar Hot Water system at the Loyola House Retreat Centre. Loyola Retreat Centre operates year round and offers 50 rooms plus a commercial kitchen. Mr. Dyck designed the system and completed the EcoEnergy Commercial Deployment grant application on our behalf. On sunny days the solar storage tank will reach operating temperature. I am pleased with the quality of work and service that Mr. Dyck provided. Local people with local roots. We are committed to the community of Guelph and Southern Ontario because we live here! "The sun shines for everyone - it is a very democratic power system. I am committed to a fair and just society and installing solar in my community is an expression of this hope." 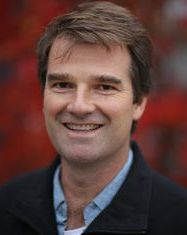 Steve enjoys politics, especially working to bring the left and right together, is active in the Citizens Climate Lobby, and was a candidate in the 2011 provincial election. He enjoys morning walks along Guelph waterways with is partner and wife Vera, who is a psychotherapist. For Steve, giving back to the community gives him joy. He is involved with Syrian sponsorship, Bridges Out of Poverty, multi-faith initiatives and FairVote. Steve founded Guelph Solar in 2009 after a fulfilling career in the automotive industry. Anton holds a Master of Applied Science in Renewable Energy Engineering from the University of Guelph. Over the past ten years of Anton’s work in solar, he has seen many residential and commercial owners join the green energy movement. Anton believes that there are many financially sound opportunities in the green economy. Everyone can participate in renewable energy generation and energy conservation projects that outperform the dated technologies that are being used. With Guelph Solar, Anton expands the reach of these smart energy opportunities for residents in Guelph and the surrounding areas. Dave studied engineering at the University of Waterloo and has a keen eye for developing models and analyzing solar production and enjoys communicating these aspects with our customers. In 2016, Dave followed his heart into the solar industry and joined the Guelph Solar Team. He is steeped in solar energy and lives on a solar-powered, organic farm. Dave rode a bicycle across Canada in 2005 and sailed across the Atlantic in 2017. He enjoys team sports and other athletic challenges. Darya holds a Bachelor of Commerce degree from the University of Guelph. 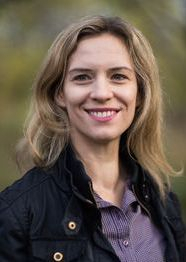 She joined Guelph Solar in 2017 after working for over 13 years in the investment industry. Darya aspires to share with others the benefits of solar as an individual investment and an investment in our community. Outside of work, Darya enjoys dancing and is an active member of the Latin dance community in the Guelph region. 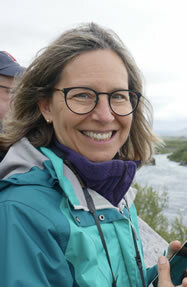 Fiona has a degree in Family Relations, studied holistic medicine, and is also a yoga teacher. She is a fantastic event organizer, working with past clients to host open houses that everyone enjoys. Fiona and Anton have three children and the family is always up for fun and adventure! 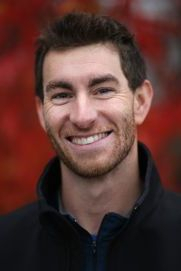 Ian holds a Bachelor of Science in Outdoor Recreation and is a Wilderness First Responder. He has worked as a Program Manager and Guide for various wilderness therapy programs throughout the US and Canada. Ian joined the Guelph Solar Team in 2013 and since has been on hundreds of roofs installing all types of electric and solar thermal systems. He enjoys working with customers to customize their solar arrays and oversees the safety and quality of the installations. Ian enjoys being a member of the Guelph community and getting outdoors whenever possible. 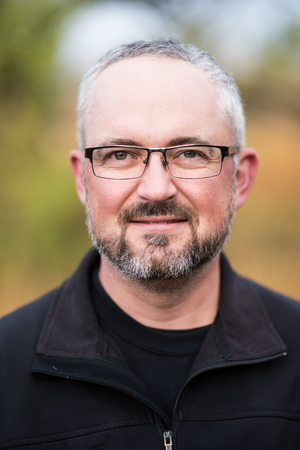 Peter holds a Bachelors degree from Trent University in Environmental Resource Studies and Politics and a diploma in Energy Systems Engineering Technology from Conestoga College. His passion for the environment stems from growing up on a small organic farm and learning about the importance of our interactions with nature. Peter enjoys interacting with customers and sharing his knowledge of Ontario's solar strategy. Mitch has a bachelors in Environmental Studies from York University with a focus on renewable energy. He has worked in the solar industry since 2011 joining Guelph Solar in 2015. Mitch's concern for the environment goes back to his days growing up in Niagara where he enjoyed all the outdoor activities the area had to offer. Nowadays, he is thrilled to be spending his time outdoors with his young and growing family. Hindy holds an Honours BA in Psychology from York University. 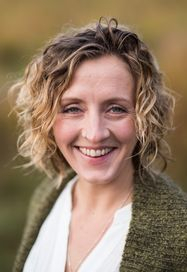 She joined Guelph Solar in 2018 after a fulfilling career in the advertising department of The Globe and Mail. In addition to enjoying many outdoor activities, Hindy also likes to spend time with her family and volunteering in her community. She loves working with Guelph Solar's customers and helping them move toward a clean energy future. Ian possesses an M.Sc. in Environmental Science and is a Certified Project Management Professional (PMP). 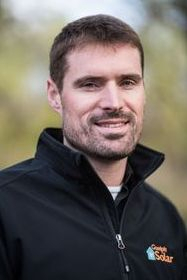 He joined Guelph solar in 2018 after 15 years as a project manager and environmental consultant. 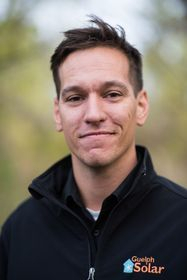 Ian enjoys applying his knowledge and experience in project management and client service to help projects run efficiently and to give clients a positive experience working with Guelph Solar. Chris holds a certificate in Renewable Energy Techniques from Conestoga College in addition to a diploma from Sir Sanford Fleming College. 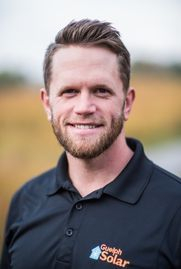 He joined Guelph Solar in 2017 after his initial 3 years in the business as a Lead Installer/Technician in the Oakville area. Dedicated to ensuring the highest job-site safety practices, Chris also enjoys interacting with customers. His dedication to solar includes installing a 7.7kW solar PV system on his own home himself. 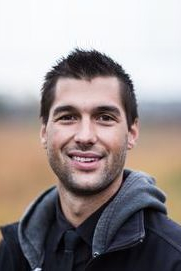 Prior to entering the world of clean energy, Chris worked for the Hamilton Tiger-Cats Football Club.